Last weekend I picked up some lovely crimini mushrooms at the farmer’s market. 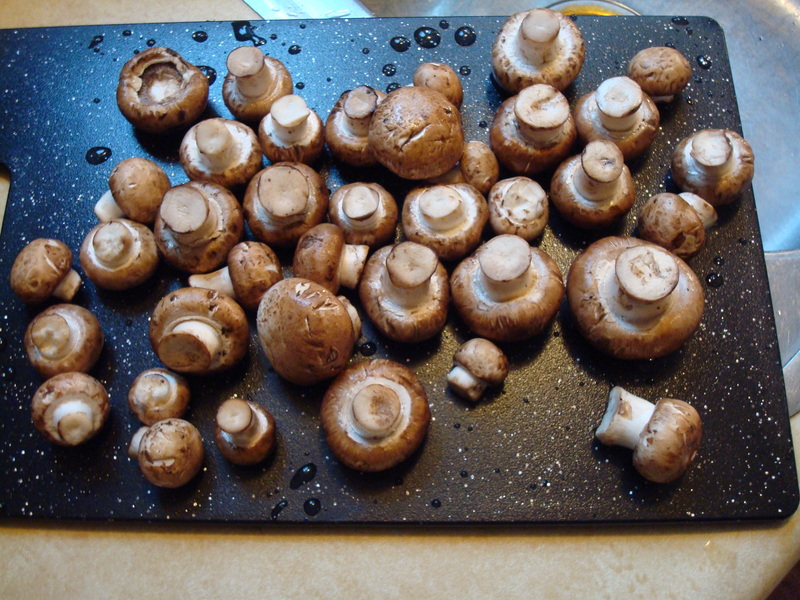 I’m not gonna lie– mushrooms are not always my favorite, but crimini mushrooms I get really excited about. I first used them years ago in a roasted vegetable/smoked mozzarella/pasta dish I saw on Everyday Italian and instantly fell in love. They are woodsy and meaty and just generally awesome so when I saw them at the market I bought them without knowing what I was going to use them for. Some of the best meals start this way! The last few days have been quite chilly and grey and rainy in these parts… it is spring after all. And with the chill and the grey and the rain I wanted one thing: hot and hardy soup. 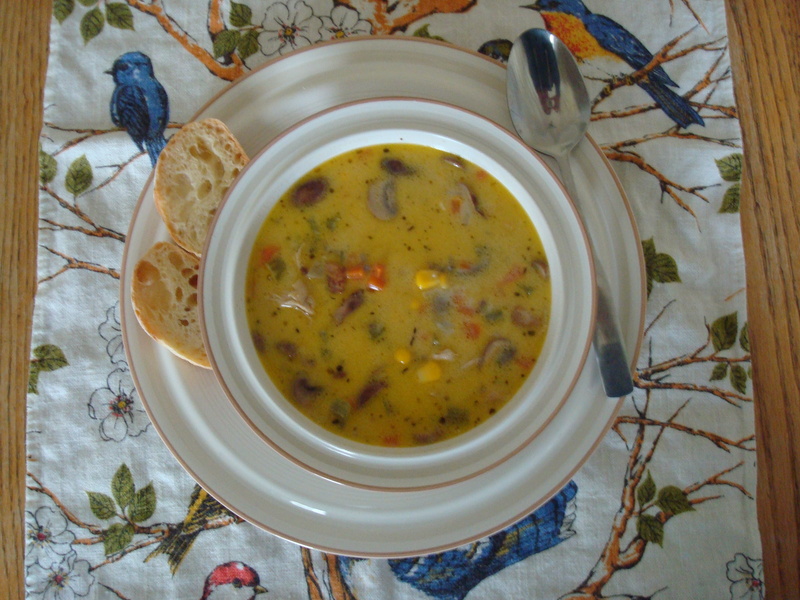 Combine the idea of soup and my farmer’s market find with a little Googling and you have Turkey Chowder with Wild Rice, Crimini and Pancetta… unless you’re me and want to use up ingredients you have on hand and then you have Chicken Chowder with Wild Rice, Crimini and Bacon. Don’t be afraid to improvise on recipes. I used to but with cooking, that is the beauty. Improvisation in baking is not always as successful, but that is another story for another time. Now we eat soup! Bring 2 ½ cups water, rice, and ¼ teaspoon salt to boil in a medium saucepan. Reduce heat to low, cover, and simmer until rice is tender but still firm to bite, 45 to 60 minutes (time will vary depending on variety of rice). Drain; set aside. Heat heavy large pot over medium heat and add bacon and cook until browned, stirring often, about 8 minutes. Using slotted spoon, transfer bacon to paper towels to drain. Add mushrooms to pot and cook until beginning to brown, about 8 minutes. Transfer to medium bowl. Add butter to same pot. Add carrots and celery. Cover; cook until vegetables begin to soften, stirring often, about 5 minutes. Add shallots; stir until soft, about 2 minutes. Sprinkle flour over and stir 1 minute. Return mushrooms to pot. Mix in chicken stock and rosemary; bring to boil, stirring occasionally. Reduce heat to medium-low, partially cover, and simmer 15 minutes. Add rice, bacon, chicken meat, and corn to soup. Simmer to blend flavors, about 10 minutes. Stir in cream. Season to taste with salt and pepper. DO AHEAD: Can be made 3 days ahead. Cool slightly. Chill uncovered until cool. Cover and keep chilled. Rewarm over medium heat before serving.